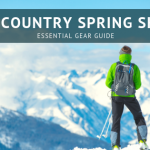 Ski packs and snowboard backpacks offer a lot of options and features over your average daypack, whether you’re skinning into the backcountry or lapping at the resort, and the variety of options, straps, bells and whistles can get overwhelming. We’ve got more ski packs than we can list here, but we thought we’d highlight a few (seven, to be exact) just to help point you in the right direction. We look at packs aimed squarely at those earning their turns, ones perfect for resort riders who occasionally duck out of bounds, and mountaineering-style packs for skiers and snowboarders with serious peaks in mind. 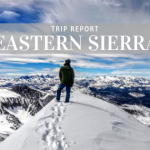 Each review details ski and snowboard carry options, storage for the rest of your gear, suspension, versatility (would this make a good year-round pack?) and who we think it suits best. To see a complete list of specs, click on the name or image to go to the product page. 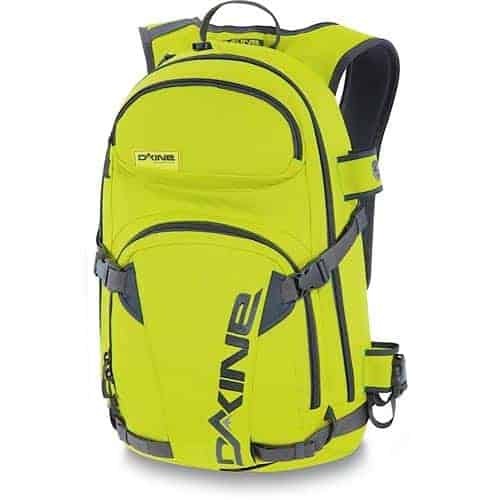 One of our most popular packs at TMS, this is a solid ski and snowboard backpack. Also comes in Freerider Pro 28 SL (Slim Line) for ladies and slender guys. Carrying options: With a plethora of compression straps, it can be slimmed down for a day at the resort. The straps are great, giving you the option of snowboard, ski A-frame and ski diagonal carries. Since that’s two compression straps on each side and two on the front, you can still balance your load with the straps you aren’t using to attach your skis or board – making this one of the best packs for carrying your sticks on your back because there’s less swinging and sagging. Each strap is reinforced at its ends so ski or board edges don’t fray or cut the material, and the whole front of the pack is covered in tough Hypalon rubber for serious durability. Storage: When it comes to the rest of your gear, the huge back panel access makes getting inside easy, and keeps your shoulder straps and hipbelt out of the snow. 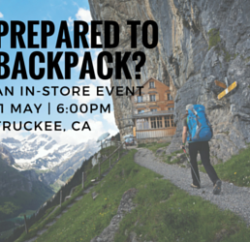 Deuter uses a really strong zipper, and buckled load lifter straps across the top to insure the zipper doesn’t fail under the weight of your pack. You can also get inside like a traditional panel-loader pack – think your old school backpack – for quick access. A roomy goggle pocket, accessed separately from the top of the pack, hangs down on the inside of the main compartment. The main compartment also houses your hydration sleeve with a port coming out at the base of the neck. Moving to the front of the pack, another panel-loading style pocket has plenty of room for your avalanche shovel, probe, skins and other odds and ends. It has four pockets and one sleeve (good for your probe or shovel handle), and a helmet holder, which attaches to the front of the pack to hold your lid when you aren’t wearing it. Ice ax loops, water bottle pockets, one hipbelt pocket and one hipbelt gear loop round out storage. Suspension: A dense foam backpanel and a flexible loop around the outside of the backpanel zipper combine to give a lot of weight transfer while staying flexible enough to move with you. The theme of dynamic movement also goes through the pivoting, well padded hipbelt. If you’re skinning on a warm spring day, down to a t-shirt, you’ll appreciate the foam channeling on the back panel that allows for some ventilation. Overall, this is a very comfortable pack. Versatility: With both a hydration sleeve and water bottle pockets, this would work year-round, so you don’t have to buy a separate day pack for day hikes. 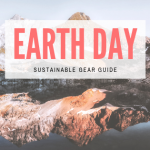 The gear loop (think climbing harness gear racks) on the left side of the belt could hold a few pieces of climbing protection – either for rock or ice, or just a biner to hang your hat. 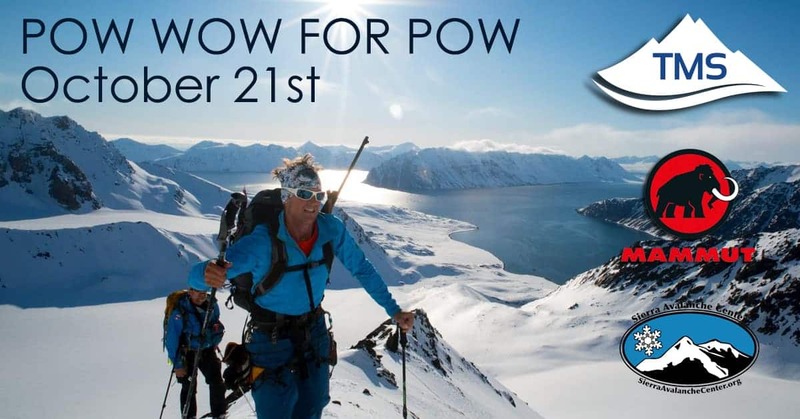 Who it’s best for: Skiers and snowboarders looking for one pack to do it all – backcountry, sidecountry, in-bounds and even hiking or light climbing duty in the off-season. Comfortable and durable, there’s a reason this is one of our most popular packs. 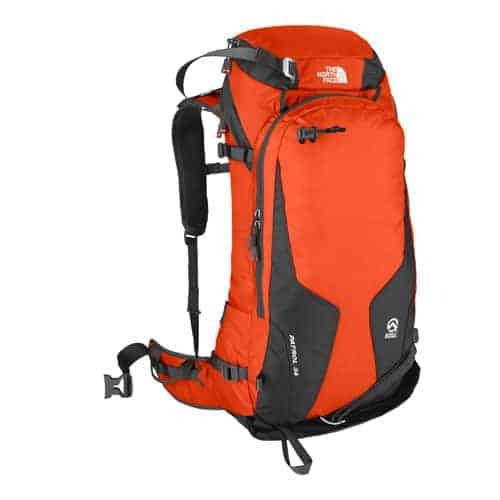 The North Face Patrol 34 – is no longer in stock at TMS; it’s been replaced by The North Face Patrol 24 ABS Avalanche Airbag Backpack – The following details still apply to the pack, only the new version is most being called the “best avalanche airbag pack of 2014”. We’ve been impressed by the attention to detail on this clever pack with a few stand-out, why-didn’t-I-think-of-that design details. Carrying options: Two compression straps on each side make for the usual A-frame ski carry, but the clever straps across the front of the pack, which use metal buckles and different anchoring points for either snowboard or diagonal ski carry, is what really impresses. The metal buckles hook through webbing loops, making them easier to use with gloved hands. The long straps can accommodate the widest snowboards. And by hooking into two different loops, they become diagonal-ski-carry ready. This is really a great way to achieve a variety of ski and snowboard carry options without adding on more and more straps. Storage: This ski pack looks like a traditional top-loader at first, but a side-entrance zipper along the back panel gives you extra access to the main compartment. Inside you’ll find a lightly padded (or insulated) sleeve for your hydration reservoir, and a skinnier sleeve for either a probe or avalanche shovel handle. Under the top lid there is a zippered mesh pocket for organization, and on top, a padded, plush zippered pocket perfect for your goggles. A front panel opening reveals your usual avalanche gear storage for a shovel and probe, and includes a visual list of the things you should always bring while backcountry skiing or snowboarding. An at-first puzzling buckle near the bottom of the pack turned out to be an ingenious separate space for climbing skins. We’d be happy to see more ski packs with this feature, and it’ll also store crampons safely. One side pocket could take a narrower water bottle or other small essentials. Like the Deuter Freerider, this pack also has one hipbelt pocket and one hipbelt gear loop. Suspension: A flexible frame sheet and rigid aluminum rod down the spine will transfer the weight of the pack to your hips well. Both the hipbelt and shoulder straps are made out of a not-too-thin, not-too-thick foam that’s supportive yet flexible. A textured pattern (oblong raised dots) on the back panel allows for extra air circulation when you’re sweating up a climb. Sliding attachment points on the sternum strap let you fine tune the fit. Versatility: The North Face Patrol 34 could also make a good year-round technical day pack. An ice ax loop and the hipbelt gear loops make this capable of light climbing. 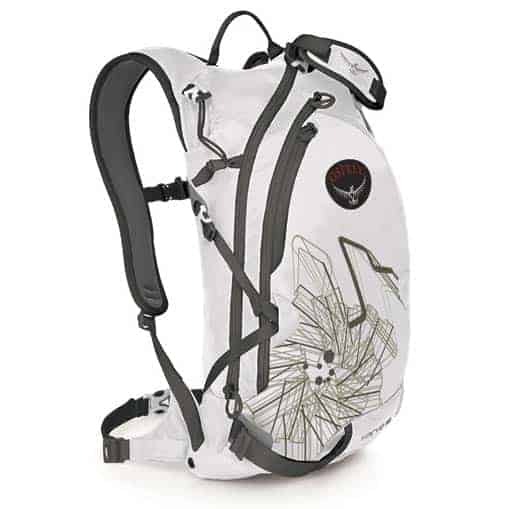 It has more volume than the Freerider Pro, but only one water bottle pocket, and not big enough for a liter sized bottle, so this pack is better to stick with a hydration reservoir. Who it’s best for: Perfect for skiers and snowboarders leaning more towards the backcountry than in-bounds, or working skiers and snowboarders who need a lot of capacity, as the name implies. This pack’s capacity and smart features bridge the gap between traditional backcountry riding and more ski-mountaineering focused adventures. Osprey Kode 30 Backpack – has been replaced by an Osprey ski backpack with some extra volume, the Osprey Kode 32 Backpack. This is a modern classic in the snowboard and ski pack category, and for good reason. Carrying options: Like the last two packs, the Osprey Kode checks all the boxes for carry with snowboard, A-frame ski and diagonal ski options. But unlike the Freerider and Patrol, this clever design makes sure unused straps are tucked away tight so they don’t snag a tree branch when you’re finding powder stashes in the trees – pretty smart. The downside is routing straps through their tunnels can be a little more fiddly with gloved hands. Big reinforced Hypalon patches keep ski and snowboard edges from doing damage to the straps and pack. Storage: Like the Freerider, this pack’s backpanel opens all the way up, revealing the entire main compartment while keeping your shoulder straps and belt out of the snow. It has a completely enclosed hydration reservoir pocket, and the hose for your hydration is enclosed on a shoulder strap in an insulated sleeve to keep it from freezing – key on cold days. One zippered mesh pocket in the main compartment with a key fob keeps small items (like keys) easy to find. next up is a dedicated goggle pocket, accessed from the top, and is big enough for more than one pair of goggles, or other sensitive gear you don’t want scratched. The avalanche gear pocket has one smaller mesh pocket and two long sleeves for a probe and shovel handle, along with plenty of space for the shovel blade and other odds and ends. Getting towards the front of the pack, another pocket reveals a large mesh panel that when deployed, wraps around your helmet to keep it secure on top of the backpack. Two hipbelt pockets give you quick access to snacks, sunscreen and a small camera. An ice ax carry option rounds out storage. Suspension: A stiff foam backpanel and flexible loop combine in a similar fashion to the Freerider to give both load transfer and flexibility. Thermoformed foam on the back creates horizontal ridges for airflow, and well-contoured shoulder straps and hipbelt wings conform nicely around the body. Load lifter straps at the top of the shoulder straps pull the pack in to the back so it doesn’t sag or sway under heavy loads. 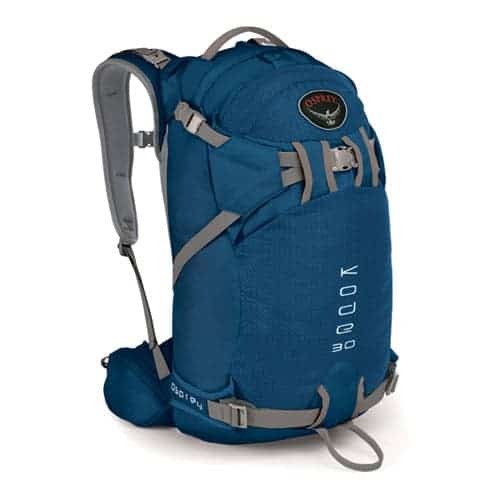 Versatility: While this pack has a good all-around volume and is of course hydration compatible, it’s strap layout and features make it more snow-centric than some other packs here. That’s not a bad thing – being purpose-built for skiing and snowboarding makes this a great pack, but not the first we’d reach for in the summer when headed out on a hike or climb. Who it’s best for: Like we said, this is a purpose-built pack for backcountry skiers and snowboarders in mind. 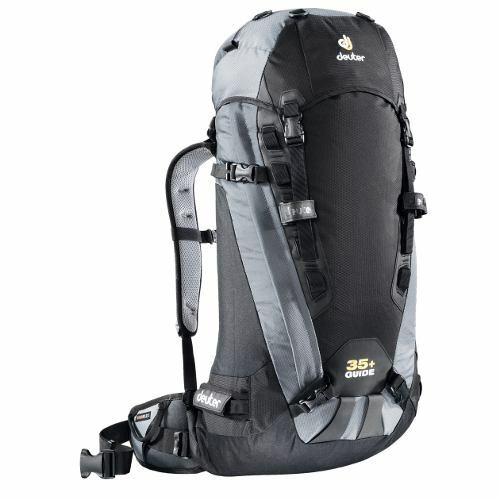 It’s size and streamlined strap setup make it good for those who need a descent sized pack for the resort as well. We love the strap design first and foremost – each tucking away nicely when not in use so you won’t get hung up on trees or the chairlift. The helmet carry option is one of the best in its class as well – and Osprey packs just plain work well and fit comfortably. The Deuter Guide 35+ is the most mountaineering-specific pack in the group with a large capacity, burly suspension and tough fabric, but that makes it very versatile at the same time. If you put serious time in the mountains, year-round, read on. Carrying options: Snowboarders need not apply, and the fattest of the fat powder skis aren’t going to get along either. This pack just has the classic A-frame ski carry, and the bottom strap is just wide enough for us to get a Black Diamond Megawatt tail through – anything bigger and you’re out of luck. The good news is Megawatts are pretty darn big, and not many people are hiking with anything bigger strapped to their backs – not for long anyways. The A-frame carry straps, especially the bottom ones where the skis rest, are super bomber – just like the rest of the pack. Combine that with the stout suspension and this is the pack you want if you’re kicking steps up a steep slope with your skis on your back all day long. Great weight transfer and balance. Storage: One cavernous main compartment swallows a day’s load – and gets even bigger when you extend the collar and lift the lid higher. The classic mountaineering/backpacking cinch-style top loading opening is augmented by a side zipper for getting into the main compartment. Unlike most of the other packs in this segment, there is no dedicated pocket for avalanche shovels, probes or anything else. A hydration sleeve holds your reservoir, and a removable foam sheet that supplements the suspension can be pulled out as a sit pad or an emergency splint. On the front two reinforced daisy chains and dual ice-ax loops make this pack ideal for carrying serious ice tools – even a rope if need be. Lash points offer a connection for Deuter’s helmet carrier, sold separately on this pack. The floating top lid has inside and outside pockets, along with four D-rings. It can rise up to accommodate the expanding collar or a rope secured by an included rope loop. The hipbelt sports two gear loops for racking climbing gear like carabiners and quick draws. Versatility: As the least ski-and-snowboard focused pack here, it falls into the “Jack of all trades” slot. Take it backcountry skiing, climbing, mountaineering, hiking, or traveling around the world – it may not have every bell and whistle, but it’s got enough to cover most bases. Who it’s best for: If you’re looking for one pack to accommodate all your mountain passions, from skiing to climbing, hiking to mountaineering, this is the one. It’ll last forever, carry whatever you throw in it, and come back for more. Guide is an apt name for the pack, as it’s perfect for anyone who relies on their pack day in and day out. Mammut has a long history in mountain sports, and it shows with the Nirvana Pro. It combines many of our favorite features of other packs in this category. Carrying options: Similar to the Freerider in strap configuration, this ski pack offers snowboard, A-frame ski and diagonal ski carry options. The bottom strap for A-frame is a beefy Velcro strap, however, and the diagonal straps stash away when not in use, leaving less straps dangling – similar to the Osprey. The snowboard carry straps wrap the edge with tough Hypalon, while the top straps for A-frame are basic webbing. The top strap for diagonal carry hides in the same pocket as the helmet carrier when it isn’t needed. Storage: The Mammut Nirvana Pro shines in giving you organized storage and multiple ways to get inside. Like the Freerider and Kode, a full backpanel access gets you into the main compartment, as well as a full panel-loading style zip access. The hydration sleeve hangs between the two access directions, acting as a divider for organization. There is a dedicated first aid pocket and extra zippered mesh pocket there too. Moving away from the back, yet another panel-loading style pocket accesses all your avalanche gear, with sleeves for a probe and shovel handle. One top pocket deploys a helmet carrier, and another reveals a soft, padded goggle compartment. One hipbelt pocket is big enough for a small camera, cell phone or snacks and sunscreen for the day. Suspension: One of the more ridged suspension systems, after the Guide 35+, combines a framesheet and loop to transfer weight from your shoulders to your hips. Sculpted foam on both the back and in the hipbelt rides comfortably, and the hipbelt is removable if you can do without. Like on the Ospreys, your hydration tube stays insulated inside a zipper-accessed sleeve along the shoulder strap to keep it from freezing on cold days. Versatility: This is definitely a pack aimed at skiers and snowboarders who earn their turns. It’ll serve as a day pack, but makes few compromises for activities outside of its intended purpose – which means it’s perfect for those who already have a good pack for hiking, biking or climbing, and want this one to be all about snow. Who it’s best for: With great carrying options, solid suspension, easy access and details like an insulated sleeve for your hydration tube and tuck-away garages for unused straps – this pack really combines some of the best features of many of the packs above – squarely aimed at core skiers and snowboarders. 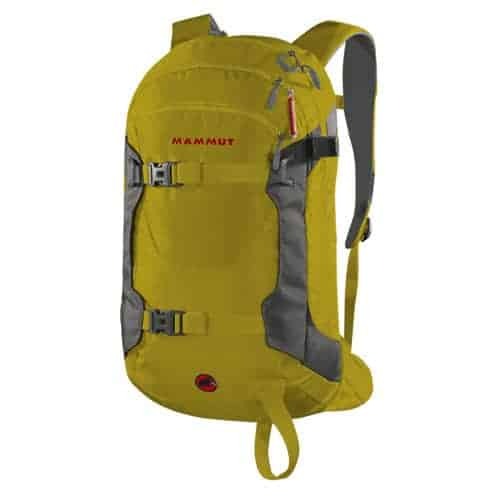 Mammut’s mountain heritage really shows in this pack, and it’ll serve backcountry riders well. One of the more affordable options in this lineup with great features that make sense for someone who doesn’t just want a ski pack. Carrying options: The side straps on the Dakine Heli Pro stay in place for ski A-frame carry or mate across the back for snowboard carry, and hidden away straps deploy for a quick diagonal carry option. It’s all basic webbing, with no Hypalon reinforcements, so it’s not for those who spend all day in the backcountry climbing tall peaks, but for somebody trying to get the last powder stashes at the resort by hiking beyond lift access. The bottom strap tucks away to stay snag-free in the trees or on the lift, similar to the Kode. A unique set of loops on the right side let you carry an ice ax if you need. Storage: Slightly smaller than some of the other packs in this test, it lends itself better to a day in the resort with some serious sidecountry action, or a short backcountry lap while the snow is still perfect. The main compartment is panel access, just like your old school backpack, revealing a bright interior that makes things easy to find. The hydration sleeve is wider than others, meaning it can accommodate an up to 15 inch laptop when its time to trade play for work or school. The front pocket can fit compact avalanche gear, or your pens, cell phone and other essentials in your day-to-day life. Suspension: Just a foam backpanel gives soft structure to this pack, so using the straps to compress your load is key in moving weight from your shoulders to your hips. Both the hipbelt and shoulder straps are well padded, and the sternum strap is easy to move up or down for the perfect fit. Versatility: This pack is unique in the group in that it blends on snow performance with daily duty ability and style. Ride the sidecountry on the weekends, wear it to school or work on the weekdays. Who it’s best for: This ski pack is perfect for the weekend warrior or student who wants a pack that can lead dual lives. At the price, it’s also a great deal for someone who doesn’t want to get into a more expensive model. This is a unique ski pack made specifically for resort skiers and snowboarders who duck out of bounds or are willing to hike for fresh powder stashes away from what’s easily accessed by lifts. Carrying options: Like it’s big brother the Kode, the Karve makes clever use of its straps and design for carrying options: snowboard and diagonal ski. Both can be done quickly and easily at the top of the lift or while lapping the booter you built – and because of the compact size of the pack – it carries skis or your board close to your center of gravity. Hypalon reinforcements keep ski and snowboard edges from doing damage to the pack, and each strap tucks away or cinches down so it won’t hang up when you’re trying to get off the lift or when you’re charging through the trees. Storage: The smallest pack in the group – it trades capacity for a low profile that makes it easier to get on and off the lifts at the resort. Its main compartment opens from one side of the pack, over the top, and down the insulated sleeve along the shoulder strap that keeps your hydration tube from freezing. It’s big enough for an extra layer or two, lunch and a few other essentials, along with the dedicated pocket for a hydration reservoir. Another side-access pocket has a soft sleeve for goggles and could squeeze a compact shovel. It also holds a strap that can be deployed for diagonal ski carry. Lastly, the smallest pocket includes a key fob for your essentials. Compression straps and pulls keep it as compact as possible, ideal for a day on and off the chairlift. Suspension: A firm foam backpanel with contoured ridges, comfy shoulder straps and a webbing hipbelt comprise the suspension for this ski pack. Because it’s a smaller pack, you don’t need the heavy duty suspension of some of the packs above, saving you weight and making it more flexible to move with your body. 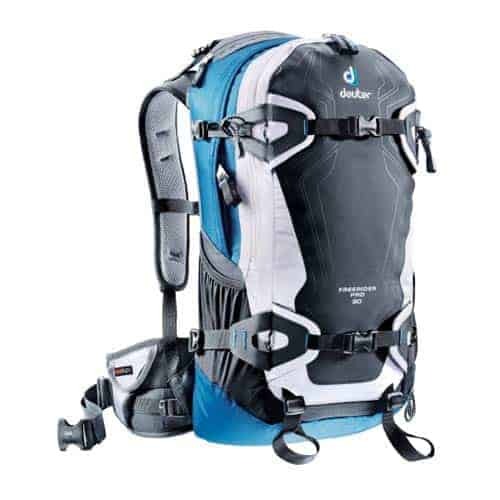 Versatility: This pack’s ideal double duty would be on a bike in the summer – the right size for a mountain bike range with room for your hydration system and the kind of compression that keeps the pack from bouncing all around as you go down the trail. Who it’s best for: If you haven’t guessed it, this is for the ski resort rider who’s willing to hike a little farther for the best terrain and the untouched snow. It can venture fully out of bounds on short missions too, and it’ll serve year round – but its most at home getting lap after lap off the chairlift. 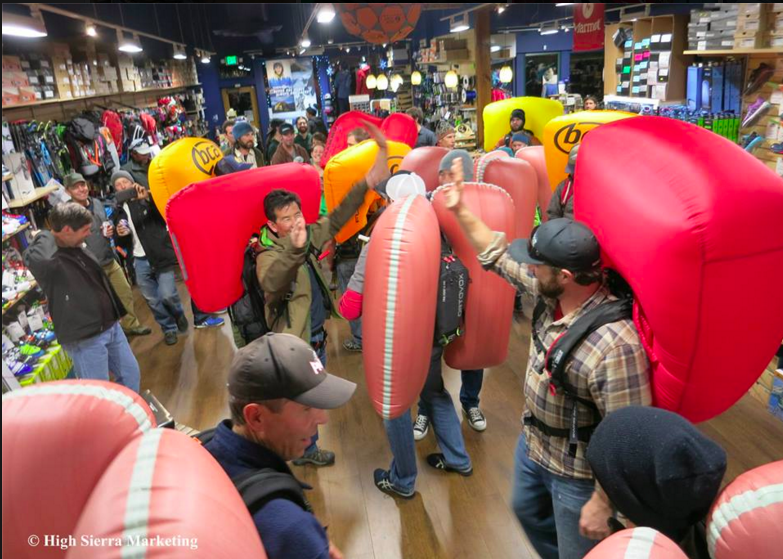 Hope this blog post helps you in your ski pack quest! For more options and ski pack comparisons, see the ski packs on our main site.